I’ve already posted on Obama’s class-warfare approach to tax policy, and I’ve also posted about the pitfalls of a tax system that exempts 50 percent of the population. Well, here’s a cartoon that cleverly combines both themes. 2 questions for you if you don’t mind. Could it be only me or do a few of the comments appear like they are left by brain dead visitors? 😛 And, if you are posting on other online social sites, I would like to keep up with you. Would you list of every one of all your shared pages like your Facebook page, twitter feed, or linkedin profile? on July 11, 2012 at 11:21 am Buy Made from Us! Thank you for any other informative site. Where else may just I am getting that type of info written in such a perfect approach? I have a mission that I am just now working on, and I’ve been at the look out for such info. I have written a treatise on the inequality of our tax system, particularly the unequal and unjust federal progressive income tax and the selective federal estate tax, as well as the inequality and injustice of calling for tax hikes on only one portion of society (the rich), thus, with all three of these, we are placing the burden of taxation on only one portion of society, instead of equally on the entire population. 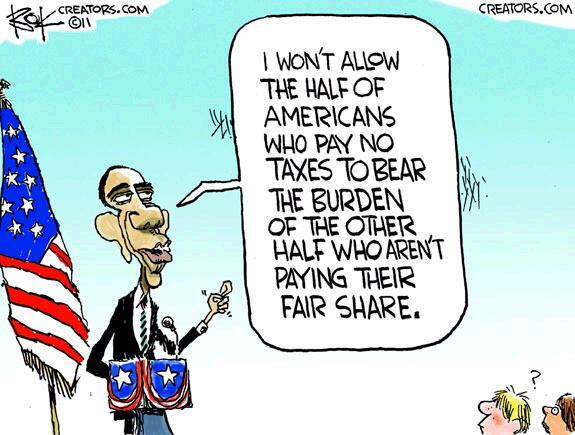 Unfortunately, Obama and his administration do understand quite well not that much taxation in itself, but how the majority of voters perceive taxation. So is Obama evil? No, or at least not necessarily. Amongst the many millions of aspiring politicians there are bound to be some who do actually believe that this is the path to prosperity. Even in America. It is “The People” who must be ready to accept this message of decline, and, as Europe proved, majorities, one way or another, sooner or later, find it irresistible to fall for that irreversible trap. The time was ripe for Americans to accept the message of decline in 2008, so the message stuck and Americans elected a president championing the irreversible path to European decline. In summary, it is the American people who reverted to the norm and elected the path to decline. Obama is simply reinforcing it and riding the wave while becoming the most powerful person in the world, for a while. Let me see America return to a 4-5% growth trendline for the next 20 years, equal to the world average, and regain (or at least retain) its prosperity leadership in the world and then I will once again believe in American exceptionalism. Wish me luck! Otherwise you are almost mathematically bound for the European road to decline. If it walks like a decline, talks like a decline, ….Those of us who have lived in the old world, immediately recognize the movie being played. Eldon, you clearly misinterpreted me. I’m a big fan of Dan and not of the president. What makes you think Barack Obama speaks for me? That sums up a person who uses words with confidence but does not tell the complete story! Eitan, you dare shame Dan Mitchell for “falling into the class warfare trap” while your president continues to vilify the business community everyday since he “took” office. Your hypocrisy is only exceeded by your stupidity. Thanks Pablo, it’s not that I think the rich don’t pay too much taxes also. I just think that saying things like “the poor don’t pay enough taxes” is politically incredibly stupid. It’s just falling for the class warfare rhetorical trap. Let’s not fall for the idea that this is about a fight, rich vs. poor. Let’s frame this as a fight, the general interest vs. the special interest or we the people vs. the government. The poor and the rich have a shared general interest in having more freedom from government. Eitan, right on. Let’s start talking about the total tax burden, not just the narrow Income Tax measure. Sales taxes, payroll taxes, and the like are regressive. That said, it’s still not even close to a fair fight. On a percentage basis, the top 50% still pay a much higher share of their income. Sales Taxes – These are not federal taxes, they are local and state. Business Taxes – Again, local and state. Federal fees tend to be the regulations and shipping tariffs. And the ‘poor’ have a choice which business their money goes to. There is no dearth of fools anywhere, isn’t there? Obama’s electoral base, those who pay no taxes, the middle class, and San Franciscans who need a $100,000 income to afford an apartment under smart growth, do not understand that they will be, in the end, the de-facto targets of Obama’s attempt to put more of the economy under collective management, with politicians acting as monopoly executives. The rich (or dual income households for that matter) are already taxed at, or near, the Laffer Curve. Both because of the Laffer curve and the fact that those rich Obama likes to speak of in his populist speeches, don’t have nearly as much money in total as most people think, compared to the totals needed to finance entitlement programs, extra taxes on the rich will bring in little extra revenue to make a difference in the survival of entitlement programs, old and new, like the recent healthcare reform. So even without waiting for the pernicious mid-long term compounding effects of high tax-low growth to kick in, the weight of entitlements will push the country towards a crisis. That is the point where Obama’s supporters will be called to participate in the grand national bargain of a shared “sacrifice” by paying VAT and excise taxes on everything they buy. Then, within a few years VAT will be at 20%. Ironically the last two steps may actually happen under a succeeding republican administration. In the big government dream of prosperity through collective management, eventually almost everyone gets screwed and thrown into the pit of permanent irreversible slow growth and decline. In trying to predict the future, why reinvent the wheel? Europe already provides the script. The movie, in the same class warfare script has already been played everywhere in the old continent, long time ago. Americans are actually so naïve as to think that Obama is presenting to his people some kind of innovative gospel of Hope N Change, yet undiscovered by mankind. All he is doing is presenting the old path to European stagnation. Why did Europeans buy it? Are Americans smarter than Europeans to avoid the siren song and its conclusion? . Eternal vigilance would be required to avoid the fate of the elephant pit every other developed country has fallen into. But such vigilance no longer exists. But, by golly, the American people will try raising taxes on the most productive first. You se, there’s a small chance that it may work and America may yet become the first high tax high growth experiment in the history of mankind! So why not try that first and forget for a while the successful recipe that made Americans the most prosperous people on earth? After all, if it doesn’t work Americans can go back to traditional American values of self-reliance…. …. can’t they? Someone needs to make a little Obama toy that keeps saying: To France! – and beyond! Dan, it’s a funny cartoon. Please don’t fall into the left’s class warfare rhetorical trap! You’re too smart for that. The poor pay plenty of taxes, like payroll taxes and sales taxes, and all business taxes which get passed on to consumers. Furthermore, the “benefits” they receive from government aren’t actual benefits but rather poverty traps. So turn their rhetoric back on them by showing how pro-growth tax reform would particularly help the poor. Hmmm… is Obama by any chance related to Yogi Berra?